The James F. Ackerman Federation is an organization of women dedicated to helping the patients and personnel of Jersey Shore University Medical Center and K. Hovnanian Children’s Hospital. The many areas of the hospital that the Federation endeavors to touch include the operation of Yesterday’s Best Thrift Shoppe. 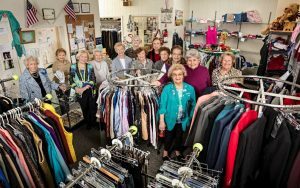 Funds raised through the Thrift Shoppe support nursing scholarships for employees of the hospital to advance their education. In addition, funds are raised through various events throughout the year such as card parties, luncheons, vendor sales, raffles, boutiques and other special events. These funds are used to support programs and services within the medical center. Thank you to the James F. Ackerman Federation for continuing their loyal philanthropic investment with a significant contribution to pediatric services at K. Hovnanian Children’s Hospital. Over the years, the Federation has supported countless initiatives to benefit patients of all ages at Jersey Shore University Medical Center and K. Hovnanian Children’s Hospital. We sincerely thank the Federation and its membership for being every day heroes, making the health of our youngest patients their mission with their current pledge of $300,000 to the Tackle Kids Cancer pediatric research and treatment initiative. For more information about the James F. Ackerman Federation and its membership, please contact the Federation Office.